Lots of kids enjoy playing school and being the teacher. This desk pen caddy will give them the perfect place to put their pencils, pens and highlighters even when they’re not playing a game. With a few colorful, old bangles and some stacking, CraftBits.com gives you a creative idea for storage. 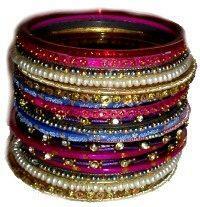 Collect some bangles of different color but of the same siz. Use a bangle to draw a circle on the cardboard and then cut it out. Now stick one bangle over the other using cardboard as the base of your stand. Stick the bangles till you get a height of around 5 inches. There is no need to color or decorate it.